Virgin Trains has partnered with Vodafone and OpenMarket to become the first company in the world to roll out the latest RCS-based ‘Chat’ service as a customer communications channel on a commercial basis. Hailed as ‘Text Messaging 2.0’, ‘Chat’ transforms the way in which companies communicate with customers, and this service places Virgin Trains at the global cutting edge of communications technology. RCS-based Chat messages carry much more information than an SMS message, enabling Virgin Trains to send photos, videos, audio and messages containing easy-to-select buttons to customers. Initially the technology will be used to provide onward journey information to its London Euston-bound passengers. Chat messages are sent to customers’ smartphones around 10 minutes before they arrive into the station and provide the latest updates for London Underground services. Customers can simply tap a button within the message to find out more detailed information from TfL – providing simple information to help with their onward journey. Virgin Trains sees the new RCS-based Chat service as an opportunity to transform communications with customers and will continue to explore and expand the way in which it is used to enhance the end-to-end journey experience. John Sullivan, Chief Information Officer at Virgin Trains, said:“We’re proud to be the very first company in the world to use RCS-based Chat actively with our customers to enrich their communications experience with Virgin Trains. We always strive to lead the way and with a proud record of digital innovation, we’re very excited to be investing in new technology that will transform the way we communicate with our customer. It has been great working with Vodafone and OpenMarket to introduce this new type of messaging, which is incredibly user-friendly. Jonathan Morgan, CEO at OpenMarket, said: “Text Messaging 2.0 has finally arrived. Chat is text messaging for the smartphone age, and it gives customers a richer, smarter, more app-like experience – all from their SMS inbox. The introduction of Chat messages is the latest digital initiative to be rolled out by Virgin Trains, who earlier this year became the first transport company in the world to sell tickets through Amazon Alexa. Other innovations that set Virgin Trains out as industry leaders for technology include the launch of BEAM (on-board entertainment portal), m-Tickets across all routes as well as Automatic Delay Repay. 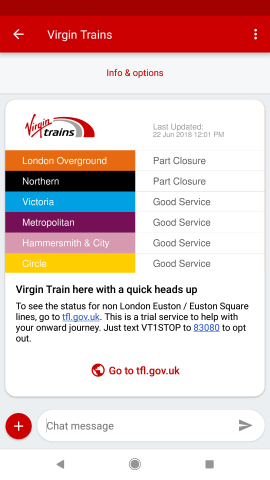 Currently, these Chat messages can be received by any Virgin Trains customer using a device on the Vodafone network that is RCS-compatible; other customers will receive an SMS text message that contains a link to Transport for London’s (TfL) website. Virgin Trains has a proud record of challenging the status quo – from introducing tilting Pendolino trains, to a pioneering automated delay repay scheme, introducing the industry-leading onboard entertainment streaming service, BEAM, and becoming the first franchised rail operator to offer m-Tickets for all ticket types. Working together, the partnership railway of the public and private sectors has published a long-term plan, called In Partnership for Britain’s Prosperity,to change and improve Britain’s railway. The plan will secure almost £85bn of additional economic benefits to the country whilst enabling further investment and improvement, and contains four commitments which will see rail companies: strengthen our economic contribution to the country; improve customers’ satisfaction; boost the communities we serve; and, create more and better jobs in rail. For more information go to Britain Runs on Rail. Visit the Virgin Trains Media Room – virgintrains.co.uk/about/media-room– for the latest news, images and videos. Subscribe here for regular news from Virgin Trains. OpenMarket helps the biggest brands in the world use mobile messaging to connect with their customers in the moments that count. When they need to be there and be responsive in real-time. When customer experience isn’t just a buzzword: it’s an obsession. OpenMarket combines a powerful, scalable and reliable platform with a deep understanding of how text messaging can transform business processes. It works closely with clients to deliver timely, useful and context-sensitive mobile messaging that surprises and delights their customers around the world at massive scale. OpenMarket calls this the Empathetic Interaction™ and its changing the way enterprises engage with their customers. With trusted relationships with mobile operators across the globe, OpenMarket offers faster time to market, and ongoing support for its enterprise customers. OpenMarket is headquartered in Seattle, Washington, with regional offices in Detroit, London, Sydney, Pune, and Guadalajara.